Omaha has slides sized for grown ups. I was in Omaha this week in meetings for my day job. If you've never been to Omaha, you may not know that it is a very beautiful art town with sculptures, handcrafted benches and an annual art show. 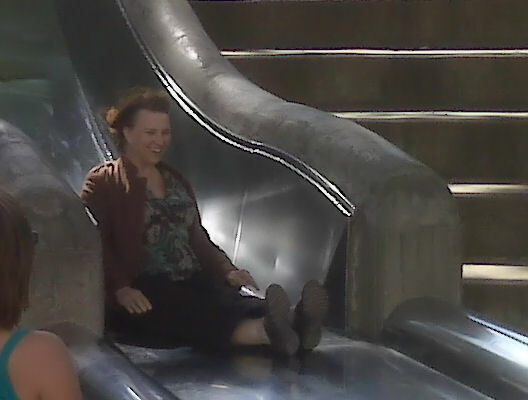 It is also an incredible place to simply walk...AND it has slides sized for grown ups!!! This was my first trip to Omaha, so I wasn't sure what to expect. It is now among my "places I would enjoy living" along with DesMoines, Seattle, Portland, Dallas and Fort Worth. The architectural firm who hosted us arranged for us to spend Thursday evening at Hot Shops--a community of over 70 artists. Hot Shops is an experiment in a commercially viable group of artists that has been amazingly successful. The potter spoke with us about the mentoring and inspiration that happens when artists are living in community. Hot Shops are in a building in the downtown area where every studio is rented with a waiting list to get in. It creates a "go to" venue not only for patrons, but also for architects and developers who integrate art into their projects. We saw demonstrations in blacksmithing, glass blowing and throwing pots. It was both interesting and inspiring to hear the artists speak about hand crafted door handles for worship projects, hand blown light fixtures and custom crafted tiles with artwork for hospitals and corporate buildings. Many of us stayed after dinner to engage with the artists to learn about their craft. We even had the opportunity to work with the potters wheel, smith or blow glass. As we returned to the hotel, I stood in the lobby of the hotel talking with several architects. 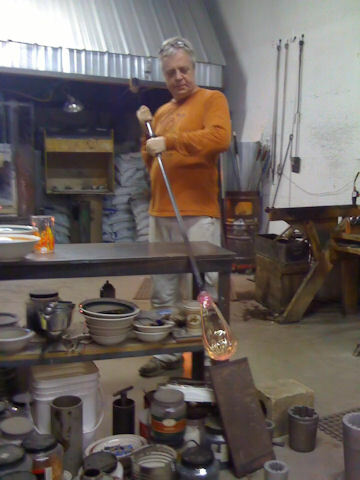 The energy sparked by discussing the magic of going from molten glass to finished product was tangible. 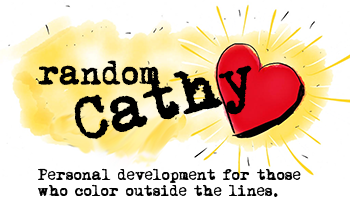 I continue to be amazed in meeting people who have deeply connected with the creative side of their nature. I believe if we are all made in the image of God and God is Creator, then each of us have that ability to create--even if it isn't in something universally acknowledged as art. At dinner one evening, I heard an artist from Des Moines speak about how many people who don't consider themselves creative, are actually wildly creative when it comes to cooking and food. Then someone at the table asked about our best meal ever. If you are ever in a conversation at dinner with people you only partially know, you should pull this out of your pocket as a conversation starter. People can get very passionate about food! I'm totally NOT creative...But, you should see my spreadsheets. THAT is art! ha!